The iconic movie character Forrest Gump (played by Tom Hanks) famously observed life “was like a box of chocolates. You never know what you’re gonna get.” The same is true for any capsicum that’s not the mild-mannered bell pepper. Even a single chile plant can produce fruit of varying potency, from mild to tongue blistering. So eating chiles is akin to Russian roulette. On YouTube we watched in horror as one culinary thrill-seeker, Jamie Kocher, ate a bhut jolokia, more commonly known as the “ghost pepper.” Toward the end of the video the CEO of the Waimea Bay Chili Pepper Company was curled into the fetal position, begging to be taken to the emergency room. The bhut jolokia is wickedly potent, ranked at more than 1,000,000 Scovilles (the measure of a chile’s heat—named for an early 20th century American pharmacist). (By comparison, a jalapeño rings in at about 3,500 Scoville Heat Units!) But the bhut jolokia was recently displaced as the world’s hottest chile pepper by the Trinidad Moruga Scorpion, 1,500,000 to 2,000,000 SHUs. Whew! Chiles—spelled “chillis” or “chillies” in Pac-Rim countries—are native to South America and the Caribbean, where they’ve been cultivated for more than 5,000 years. (Most wild chile plants owe their existence to birds, a creature that spreads the seeds but is oblivious to chiles’ heat.) Christopher Columbus takes credit for introducing the chile to Europe back in 1493, though he erroneously associated it with black pepper. (Like potatoes and eggplant, chiles actually belong to the nightshade family.) In less than a century, the chile pepper completely circumnavigated the globe. Today, many food cultures are defined by this fruit (for botanically speaking, the pepper is a fruit, not a vegetable). Consider Peru’s ají de galina (chicken chile stew). Hungary’s paprikash. And of course North American chili. One out of four people on the planet eat chile peppers every day. California is the largest grower of chile peppers in the U.S.
Chile peppers are the official state vegetable of New Mexico. Not surprisingly, New Mexicans consume more chile peppers than Americans in other states. George Washington and gourmand Thomas Jefferson both grew chile peppers. Compounds from chile peppers are used in topical pain patches as well as over-the-counter medications like Sudafed and Robitussin. More than 140 varieties of chiles are grown in Mexico alone. Chile peppers are a rich source of vitamins A and C. Ounce for ounce, chile peppers contain more vitamin A than carrots and up to six times the vitamin C in oranges and other citrus fruits. Size matters. In general, the world’s hottest chiles are under 3 inches long and have narrower shoulders than less potent chiles. Chile peppers are one of the world’s most popular spices, second only to salt as a seasoning. 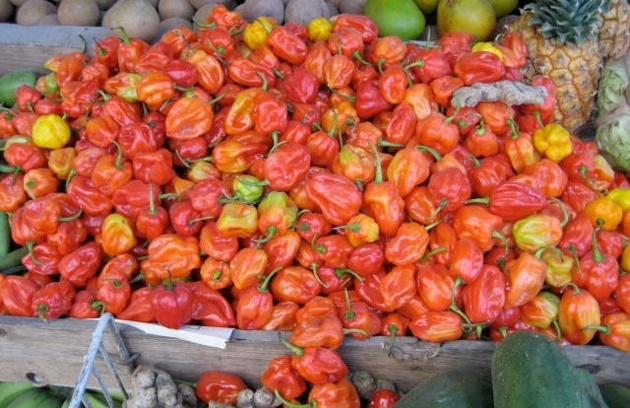 In many cultures, chiles are believed to have aphrodisiacal properties. Please share your experiences with this phenomenon on the Barbecue Board so we can know if it’s really true. Dehydrate fresh chiles until completely dry, then tear into pieces and grind in a spice grinder to make your own chili powder. For the best flavor, briefly toast dried chiles in a cast iron skillet or on a Spanish-style plancha. Rehydrate in warm water to add flavor to soups—especially chili—and stews. Roast, peel, and seed poblano peppers, then stuff with scrambled eggs and cheese. Rarely does a recipe use more than one or two canned chipotle chiles (smoked jalapeños) in adobo sauce. Transfer the remainder to small resealable plastic bags, label, and freeze. Nice to have on hand when you want to make my cousin David Raichlen’s Chocolate-Chipotle Ribs. Need an idea for “Meatless Monday”? Grill fresh poblanos until the skins blister and blacken, along with a large sweet onion cut into wedges. (Leave the onions attached at the stem ends so they don’t fall apart.) Peel and seed the poblanos, then tear or slice into strips to make rajas. Coarsely chop the onion. Add grated cheese for vegetarian tacos or quesadillas. MAKE THE BACON-CHEDDAR JALAPENO POPPERS! SHARE YOUR IDEAS FOR HOW TO GRILL WITH CHILE PEPPERS ON THE BARBECUE BOARD! TO LEARN MORE ABOUT HOW PEOPLE GRILL CHILES AROUND THE WORLD, CHECK OUT THE BOOK PLANET BARBECUE!